Don't want to brand or hot stamp your work? 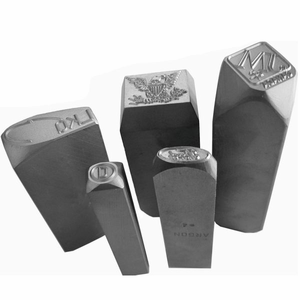 Make your mark with a BRAND-FIRST custom steel hand stamp. Our custom steel stamps are machined from tool steel and heat treated to provide a long stamp life. (You can mark softer steel with them if you want). Made to be hit with a hammer, however, you may choose to press it in by using arbor press. NOTE: The harder the wood, the better the mark. Paint fill the mark to make the indentation stand out !